In previous blogs, we have discussed how our process for stabilizing rice bran is effective and efficient for feeding livestock and other applications, including food. When considering the amount of rice produced around the world and an expected increase in animal production, stabilizing rice bran to create a high-quality feed ingredient has become of greater interest to producers. Rough rice, also known as paddy, consists of a white, starchy kernel, surrounded by a brown coating of bran and wrapped by a loose outer hull (husk). Rice bran is a by-product of the rice milling process, where the hull and bran are removed mechanically to obtain white rice. Though rice bran has great properties and nutritional value, it also has a unique and powerful enzyme system which is activated during the milling process. This causes the oil in rice bran to hydrolyze rapidly into free fatty acids (FFA) and glycerin, negatively affecting the palatability and quality of the rice bran. The rate of hydrolysis varies with temperature and other factors, but can lead to roughly 30-50% of the oil being converted to FFA within a week, under tropical storage conditions. Insects also start to appear during this time. With Insta-Pro’s high shear dry extruders, the enzymes in rice bran can be deactivated by heat and friction. The oil in stabilized rice bran does not degrade when the bran is stored for several months and the FFA content remains fixed at the level it was at the time of stabilization. Through recent testing, we have discovered that rice bran should be stabilized within 8 hours post milling. 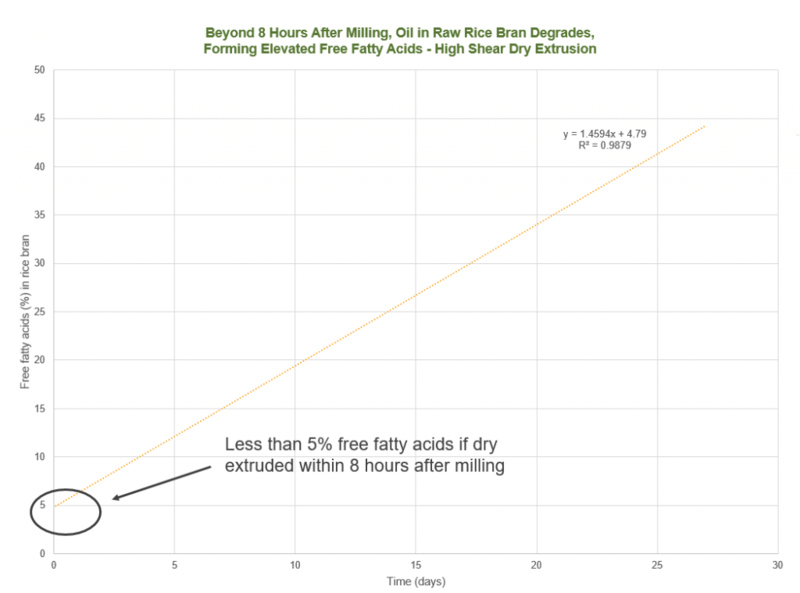 If the rice bran is not stabilized within 8 hours, the oil in raw rice bran degrades, forming elevated free fatty acids as demonstrated in the chart below. When rice bran is stabilized, it is converted into a high-quality ingredient for feed, food and edible oil. It is important to stabilize rice bran because the higher the FFAs in the oil, the higher the refining loss for edible oil. For human consumption, rice bran has been backed by the American Heart Association to lower cholesterol. The USDA also states that rice bran is a good source of vitamins, minerals and omega 3, 6, and 9. In animal feed, stabilized rice bran can be used as an ingredient for swine, poultry, equine, aquatics, and deer. In conclusion, stabilizing rice bran with Insta-Pro’s high shear dry extruders allows rice millers to store stabilized rice bran for months. With stabilized rice bran, rice millers control when to sell for a greater value, open the door to new industries by providing higher quality ingredients, and open new markets due to their ability to export to other countries. Please contact your sales representative for the most recent R&D studies in stabilized rice bran.